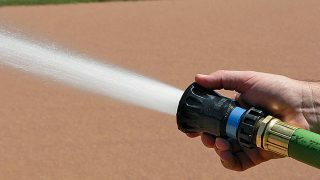 When the baseball/softball season is rolling along rain showers can become a regular factor for groundskeepers. 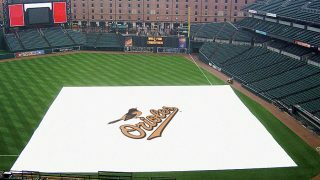 But area tarps are used for more than just rain protection. 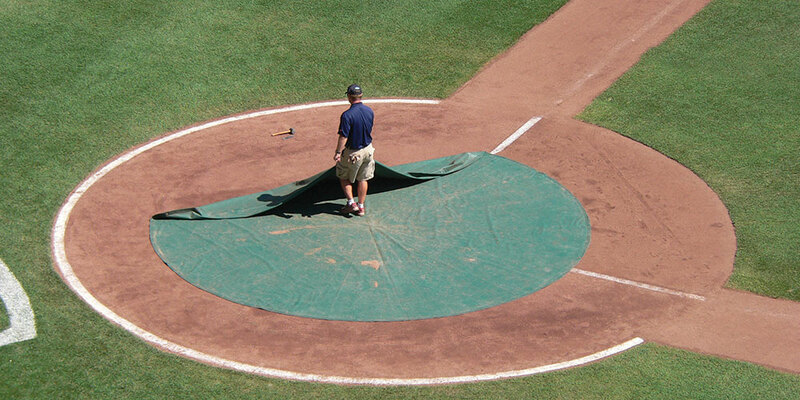 In fact, the primary purpose of mound covers and home plate tarps is to retain and manage moisture in the soil and clay beneath them. Tarps are put in place to keep moisture from evaporating from the mound and batter’s and catcher’s boxes. The more moisture you keep in your clay areas, the better they perform and the less wear you will experience in those areas. 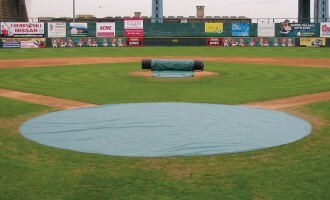 Protection from rainfall is actually a secondary benefit of tarping the mound and plate areas. But this is as equally important as holding moisture in. 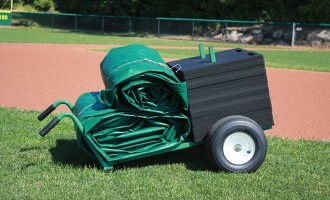 There are several different types of tarp materials available but this post really deals with the care and anchoring of these important groundskeeping tools. When you first get your new area tarps the material is very flexible and easily manipulated. Over time, the sun’s UV rays will slowly breakdown the UV protection that is incorporated in the material when the material was produced. As the UV protection breaks down, the tarps slowly take on a more brittle feel to it as the material dries out. This is the time when damage can begin to show on tarps, but how you handle your tarp can determine how quickly problems will begin to occur. 1. Fold your area tarps as little as possible. Roll instead of fold when you can. If you must fold, use as few folds as possible. Locate the folds in a different orientation each time you have to fold a tarp. 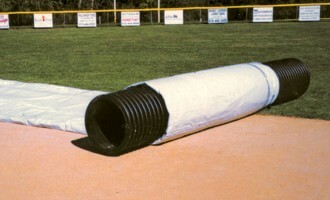 If you have a large infield tarp on a tarp tube, store your smaller tarps fan folded on the top of the tarp tube for rapid deployment. 2. Keep your area tarps as clean as possible. 3. Repair area tarps as soon as a rip or hole is discovered. With holes located, aggressively clean a large area around the hole or rip on both sides of tarp. Dry thoroughly. With spare tarp fabric that your manufacturer can supply you, cut a patch larger than the hole in the tarp. Never have square corners on a patch. Make patches round, or if rectangular, use rounded corners to prevent the patch from snagging on something. Using vinyl or contact cement, apply to both patch and on tarp around the hole. Allow to dry a few minutes and then center patch over hole and apply. Patch the same area on the other side of the tarp as well. 4. Properly secure your small tarps to prevent wind from pulling them loose. 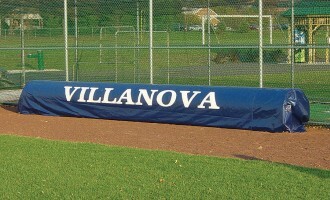 Under normal weather conditions, the tarp can be anchored every 6 to 8 feet. When stronger winds are expected (≥ 20 mph), secure small tarps every 3 to 4 feet. Tarp pins 10″ long provide excellent anchoring. Weighted tarps with ball bearings or chain sewn into the hem on the perimeter also do a great job anchoring, but the tarp overall is much heavier and harder to dump and fold. Rubber Beacon Field Weights are an excellent alternative to sand bags that breakdown in the sun and spill sand everywhere. I usually DO NOT recommend parking equipment on tarps to anchor due to the abrasion that can occur to the tarp from the wheels turning on a tarp with gritty infield topdressing underneath. 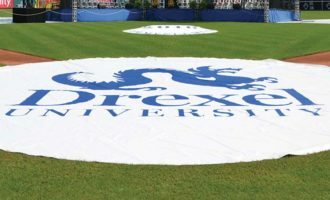 Follow these basic care recommendations and you should be able to get maximum use out of your softball and baseball area tarps for several years. P.S. — Small plug here, but if you want to save your tarps and your back, I recommend our tarp carts, available both for pinned tarps and weighted tarps.